Use with 350ci block and 400ci crankshaft. This is a stroked 350ci chevy combination. New high silicon alloys and diamond tooling have give Keith Black designers the material and equipment for performance breakthroughs in engine design. 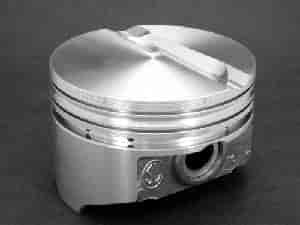 KB piston are 100% CNC machined and T-6 heat treated from 16%-18% silcon Hypereutectic alloy. Features include drilled oil returns and pin oil supply, .072'' spiral wound retaining ring, 100% diamond turned, compensated high strength ring lands, high top ring location, 360° pressure pin oiling, diamond honed pin hole and lightweight rigid rib skirt design.